The Opera-house took fire. Rose Bertin’s establishment in the Rue Saint-Honore was situated between the Rue Champfleuri and Rue du Chantre, both of which have disappeared; in fact, it was built almost on the spot where now stands the entrance to the Louvre, called the Saint-Honore Door. The Opera was at the corner of the Rue de Valois, quite near to Rose Bertin’s shop. The fire was very considerable, and there were various victims; but the number would have been much greater but for the presence of mind of the ballet-master, who was on the stage when the fire broke out. It was on the night of June 8. The air was heavy and stormy, and rain had begun to fall. The ballet “Orpheus” was being given, when the ballet-master gave an abrupt order for the dancing to cease, which caused a certain amount of murmuring among the audience; the curtain was instantly dropped. Order was then given to cut the ropes which held the piece of burning scenery; the order was clumsily carried out, the ropes being cut on one side only. Hanging in this way the scenery burnt more quickly, and soon the whole theatre was in flames. The smoke had already driven the audience out, their cries awakening the whole district. People crowded to their windows, and the street filled quickly. A fire in the Paris of olden days, with its narrow streets, was a terrible business. People could still remember the fire which consumed the Hotel Dieu on December 30, 1772, and cries of alarm arose as a column of flame more than 200 feet high shot into the air, “tinged with many colours, an effect due to the burning oil-painted scenery and gilded boxes.” The Palais-Royal was in great danger; the roof several times caught fire, but was speedily extinguished. Not only the Palais-Royal but, indeed, the whole district, was in danger from the continual shower of burning sparks and splinters which fell on the adjoining roofs. The reservoirs, which should have been full, were absolutely empty. Anxiety was at its height during the whole of that night, the panic being considerably increased about half-past nine by the falling in of the rafters, which caused a great shower of sparks. Happily there was no wind, and, as rain continued to fall, the fire was confined to the theatre, which was completely burnt; it had been burnt before in 1773, and rebuilt on the same site. 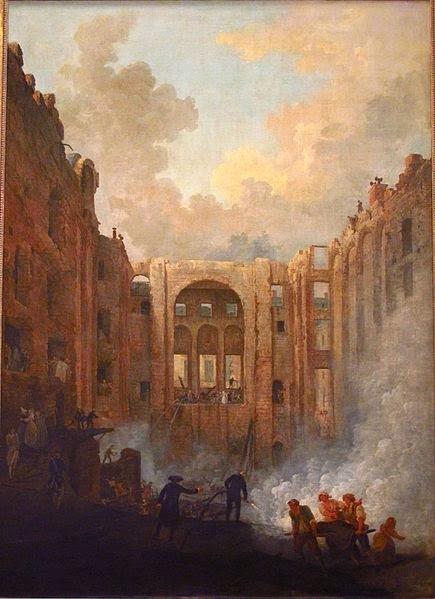 On June 15, a week after it had broken out, the fire was still burning in the foundations of the theatre. Rose Bertin might have watched from her windows the sad cortege which bore the bodies of the victims to the Church Saint-Honore, facing her shop; and as the search in the ruins of the theatre continued some days, she was an eyewitness of the heart-rending scenes, no one being better able than she to carry news of the search to the Queen, who was at Marly expecting her second child. The fire at the Opera-house, of all theatrical fires in Paris, has only been surpassed in horror by that which consumed the Opera Comique in 1887, when there was a holocaust of more than 200 victims.